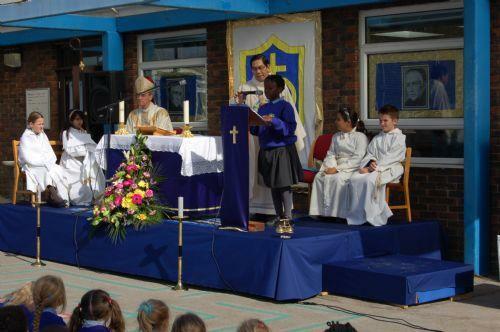 Blessed Dominic Catholic Primary School is a Voluntary Aided School and our primary role is to serve the Catholic community of St Margaret Clitherow and other neighbouring parishes. Our school life is based on Christian Values. We recognise and respond to the needs of each child academically but also in their growth as an individual. We develop happy, fulfilled, well-educated and confident children in a caring, disciplined environment with our Faith as the focus of our actions. We expect and encourage excellence in all aspects of school life. Education is a partnership between home, school and parish in which we seek and encourage the participation of parents in the learning process and in the life of the school. Parents are welcome partners in the education of their child and in the development of our school family. Parents are expected to uphold and reinforce those fundamentals of the Catholic Faith, which will be taught in school. The school looks to a partnership with the parents in the development of the Faith and religious commitment of their child. To this end, parents are expected to encourage by their own example of religious practice and on occasion to join with the teachers and governors in liturgies, assemblies or activities that might help them to foster the love of God and response to the Gospel in the children. First Holy Communion preparation takes place in the parish for pupils who are in Year 3. During the year, a series of meetings for parents are held in the parish to enable parents to take part in the very important process of preparing their children to be full members of our church. We value the contribution of parents who actively support the home/school/parish partnership. All pupils take part in a Reconciliation programme prior to making their First Holy Communion. The programme of Religious Education that the school follows is in line with the Curriculum Directory as specified by the Bishops Conference of England and Wales. Religious Education is taught to all children in the school and is considered central to the whole school curriculum. RE lessons account for 10% of curriculum time. We follow 'The Way, The Truth and the Life' scheme. Through this scheme, the children are taught the basics of Catholic faith and morality, through constant reference to their own life experience. They are helped to come to a fuller knowledge and love of God, which will develop into mature Christian living. This is the overview of the themes from 'The Way, the Truth and The Life,' which the children follow in school.